- In the meantime, I was (and still am) having all these weird issues with my eyes swelling and getting irritated and turning red. They're itchy ALL THE TIME, even though I'm using Visine by the bucketload. This happens whether I wear makeup or not. - And this is a separate issue, even though it also involves my eyes, but apparently the only painkiller I can take these days is acetominaphen, because if I take ibuprofen or naproxin, my EYELIDS swell up. I did not used to have this before. In reorganizing my makeup collection last night, I realized that I really need to get my lipstick situation under control! They were just sitting loose in a drawer (a couple drawers), and especially when you have lots from the same brand, it's hard to easily tell which one is which without picking up every single one to read the bottom. A long time ago, I saw this tutorial from makeup artist EnKore, about how to make your own organizer using cardboard boxes. I've always wanted to make one, but never got around to it because it's kind of tedious, time-consuming work. But finding myself with some spare time yesterday, I finally decided to bite the bullet and make one. Mine isn't nearly as neat or tidy as his is (can you tell that I colored outside the lines in art class? ), but it works well enough for me. As you can see, I've saved a ton of space, and I can easily find exactly what shade I'm looking for. 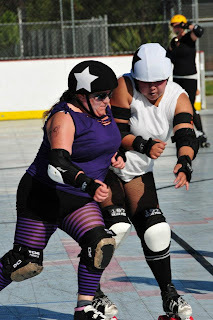 As popular as it has gotten, roller derby is still considered "alt." We are just outside of the mainstream sports world, and we're definitely fighting to get in, but there are still so many people who hang on to misconceptions and stereotypes, and people who just plain don't know anything about it. 1. It's not acceptable to hip-check people in real life. 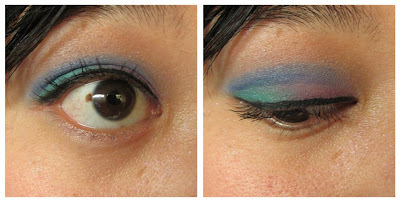 The clincher is the crease color I used, Royal Sugar - it's a BEAUTIFUL shade of blue, but I've had trouble figuring out how to incorporate it into a wearable look. (That is, wearable in the normal world. I don't "club" and I'm not in high fashion.) So far, I've only been able to wear it in small bits (never just "all over the lid"), and I have to mute it/blend SUPER well. You know what IS just like Sally Hansen Hidden Treasure (the original one)? Essie "Shine of the Times" Luxeffects topcoat :) Dude, I even bought a spare bottle. As you can see, it does that cool abalone-shell effect :) I have all different colors on my right hand as well (from Sally Hansen and Urban Decay). I really wanted to see how they look with the topcoat. Essie's Luxeffects were new for the holidays, so you MIGHT still be able to find them right now at your local drugstore. I called, like, three Walgreen's and a Rite Aid before I gave up... and then found three bottles at CVS. Sally Hansen Hidden Treasure (version 2) isn't really a hidden treasure. When Sally Hansen released the first Hidden Treasure polish, it was a HUGE DEAL and I couldn't find it ANYWHERE except for on Ebay for a ridiculous amount of money. It was this amazing thing that transformed your nail polish into this awesome abalone-shell-iridescent effect (eh, google it), and it was nowhere to be found, thanks to the blogosphere. So this is the new Hidden Treasure - it's also iridescent, with a purple sheen. But it noticeably lacks the flakes of glitter that made the first one so magical. Does it measure up? In both cases, it's beautiful, but it's just not the same. Yeah, it does duochrome-y things, but it's just not the same. I AM DISAPPOINT :( I mean, it's a gorgeous color regardless, but it shouldn't be called Hidden Treasure. 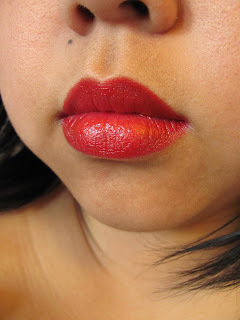 It's been a while since I did a red lips post, and I've amassed some new ones since then. Here's what I have currently (and I totally have more on the way - Morgana Cryptoria!!!). I didn't test any of these for wear and longevity - I just wanted to show how they look on me. Urban Decay's Super-Saturated High Gloss pencil in F-Bomb I LOVE this. It's lightweight, soft, not too shiny. The pencil format makes it easy to maneuver. This shade of red fits its name perfectly. Revlon Lip Butter in Candy Apple Apparently these are the hot drugstore item right now, and I totally understand why - they're glossy, moisturizing, and named after sweet treats :) This one is sheer and (I thought) a little more on the orangey side, but just a teensy bit. It's like a super-pigmented lip balm. I haven't played with my Sugarpill Chromalusts in a while, and I'm so in love with my Empire/Uzi pencil that I wanted to wear MORE PURPLE! MORE MORE PURPLE! As much as I am on a constant search for red lipsticks and glosses, I must confess that I have a MUCH harder time finding the perfect pink - not just finding the right undertone, but also just finding the right shade for my skin tone. I can wear a bright fuschia pink just fine (I LOVE Urban Decay's Jilted lipstick), but when it comes to the lighter, paler pinks, it's hard to find one that doesn't look too chalky. So far, I've found some MAC that works, and I like them a lot. 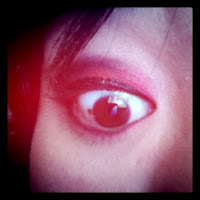 But when I saw these two new releases from Urban Decay, I had to give them a try. New for spring are the Pocket Rocket lip gloss in Rashad (available from UD's website) and the Super-Saturated High Gloss Lip Color pencil in Lovechild (available exclusively at Sephora; there's also a lipstick of the same name). I have both the Pocket Rocket and the gloss pencil in other shades, so I'm a big fan of the formulas, and I was pleased about how both looked on me. I've had the new L'Oreal Infallible shadows for a week or so now, but until now I haven't had a chance to really dig in and try them. They're supposed to be the drugstore dupe for Armani's Eyes to Kill shadows (I still haven't been able to allow myself to spend over $30 on one eye shadow, no matter how much they are raved about! ), so I scooped up a few, along with a few of the new Maybelline Color Tattoo cream eye shadows that I ended up reviewing for Painted Ladies.